It has been a wet winter! However there have been brief intervals when for at least a day or two the rivers have been fishable. 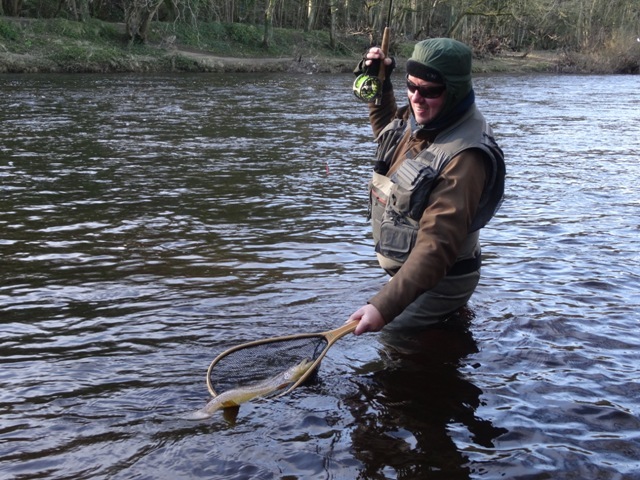 Like the famous snake the Cobra, in winter, when river and weather conditions combine the river fly fisher has to take the opportunity and strike, or rather fish! 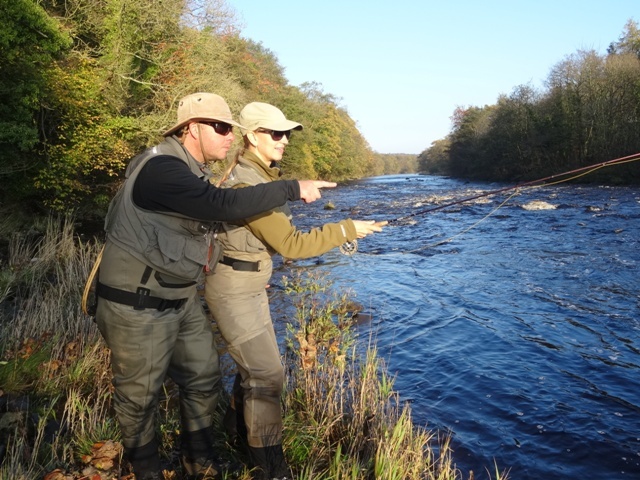 The next available chance to fish here in Northern England could be weeks away with yet more Atlantic depressions bringing wet and windy weather and the consequent swollen unfishable rivers, for the foreseeable future. We have been fortunate enough in the last few weeks to enjoy a few stolen days on the river and they are gladly accepted like an oasis in the proverbial desert. Our last trip out in glorious winter sunshine in February 2016 is illustrated. We arrived on the Tees at 11.00 am. 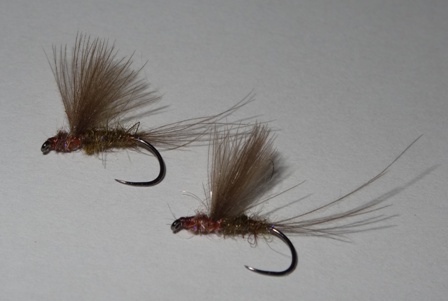 Czech nymphing for grayling was our intended method using 3 flies. The set up was simple; a 4mm tungsten Polyphaetis on the point to take our flies down to the required depth in the faster river flows encountered in Winter. A 4 mm Tungsten bead is more than twice the mass of two 3 mm tungsten beads. It is heavy and goes down fast! On the dropper about 18 inches away was the Rainbow nymph. The top dropper was a black magic size 14. After only a few casts the Onstresam-guide in-line bead indicator twitched and I instantly lifted the rod into a good fish. This was an out of season trout that took the Rainbow nymph. 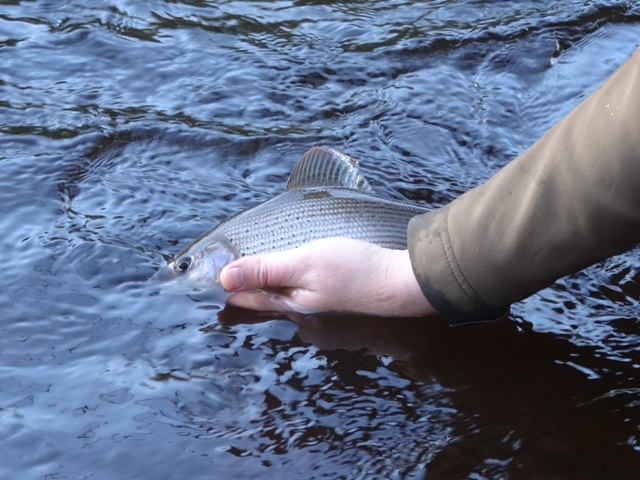 Only two minutes later and a beautiful grayling was brought to hand and released. Nellie in the meantime was getting frustrated. Like a gentleman I’d let her fish down the pool first. However it appeared that the fish had a preference for my flies. It was time to go into guiding mode. With encouragement and perseverance Nellie was rewarded with two beautiful grayling. She also pointed out the obvious. That standing in a river for long periods of time in winter is a questionable activity and certainly one which leads to rapid cooling in the extremities or to put it more succinctly as she did “My feet are blocks of ice”. Never mind our mission was accomplished. We had made the best of a day with decent conditions and now it was time to retire for a pub meal next to a real fire. We can fly fish through the winter, but we have to choose our days wisely on a wet and wild winter like this one. Next week we are taking the opportunity to exhibit at the British Fly Fair International. We are really looking forward to seeing you there. Please come along and chat with Jonathan and Nellie at our Onstream-guide stand. It is held at the Staffordshire County Showground ST18 0BD (13th and 14th February 9.30am – 4.30pm). We will have some Fly show specials and this is an excellent time to buy the materials for our new DVD which will also be available, called “A half Dozen Deadly River Dry Flies...how to tie and fish them”. We can even tie flies for you live on the spot and answer your queries. It was very interesting and enjoyable meeting many of you there last year and we look forward to seeing you all there again. I have had many great moments on the river with many of you and look forward to sharing and recalling those moments. Spring is now on the way and stolen days should be more common. Longer days bring hatches of mayfly, specifically early season the large dark olive as featured in one of our You Tube videos “Dances with Olives and dates with Trout”. Our match the hatch large dark olive in size 14 or similar pattern is a must for the early season dry fly fisherman (featured on our DVD). At the moment after months without seeing fish rise, this is still a mirage. But the New year is well upon us and the start of the New fly fishing year for wild river trout is fast approaching. Nellie and Jonathan wish you all the best of luck for the new season. We will soon be able to cast a dry fly at rising fish and our souls will be at peace. We will be featuring new season dry fly sport on our You Tube channel so stay tuned. The trout season cometh! Look forward to seeing you at the BFFI.